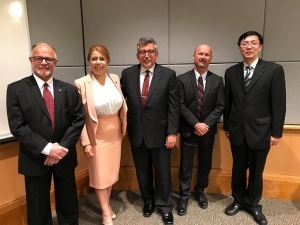 The search for a new President/Superintendent of Imperial Valley College has been narrowed to five finalists, and the campus community as well as the public at large had an opportunity yesterday to hear from the candidates at a Public Forum and give written comments to the Board of Trustees. The trustees have scheduled a special meeting at 3 p.m. today Wednesday, May 2, when they will be doing their own closed-session interviews. Robert A. Frost, Ph.D, currently (interim) Dean of the John Adams Campus of City College, San Francisco. Christopher Villa, Ed.D, Vice President of Student Services at Los Angeles Mission College (LAMC). The candidate selected will replace Victor M. Jaime, Ed.D, who is retiring from IVC after 38 years of service as an administrator, vice president and president/superintendent.